2018 saw a lot of changes to how I do business. I’ll dig into the details soon enough, but first I’ll share my sales from December which haven’t yet been posted. 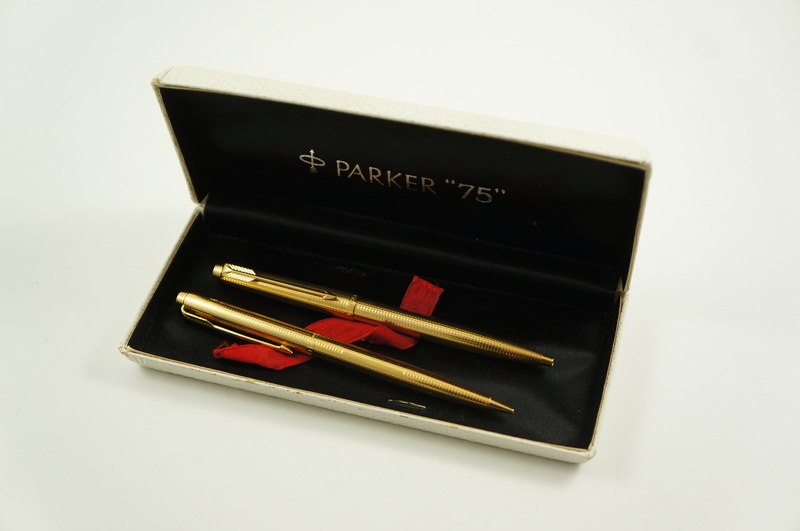 Vintage Parker 75 ciselé ballpoint pen & mechanical pencil: 150$. Found in CDN. 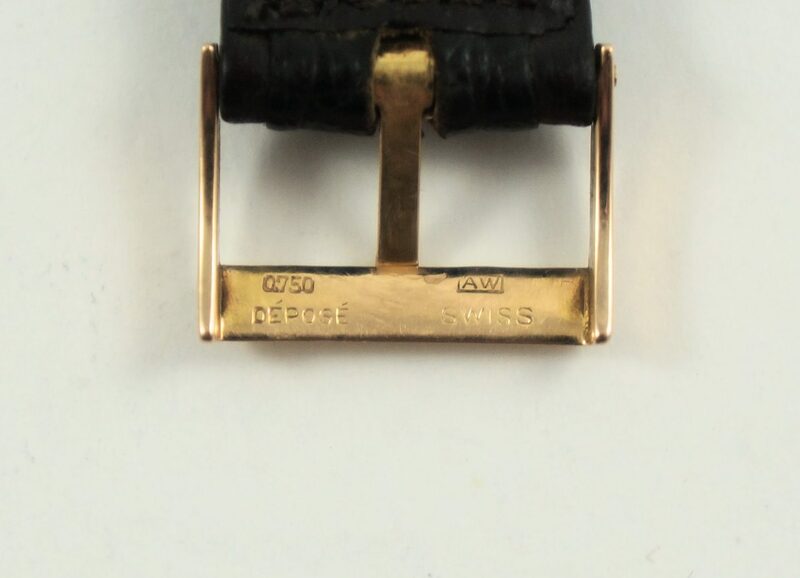 Watch strap with 18k gold buckle: 400$. This was definitely produced for one of the luxury Swiss watchmakers, and bought by someone who wanted all original parts on their fancy timepiece. Found in Nouveau-Bordeaux. 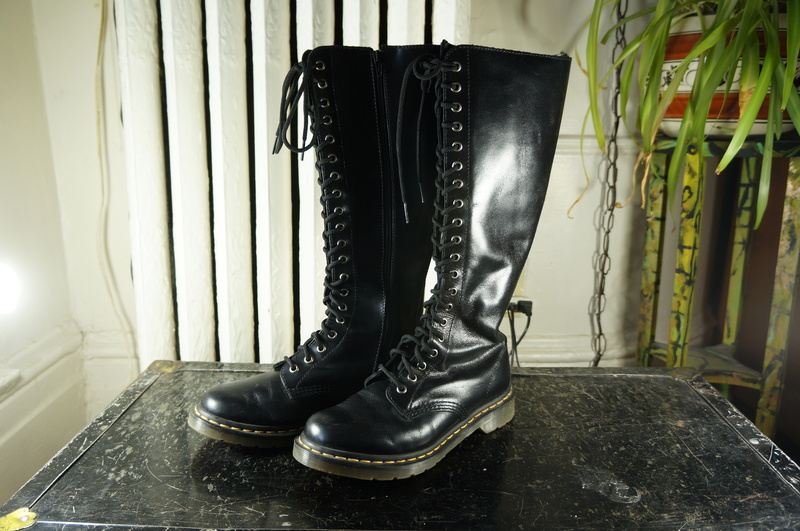 Doc Marten 1B60 20-eye boots: 180$. These looked barely worn, and the buyer was very happy judging by the enthusiastic feedback I received. Found in TMR. 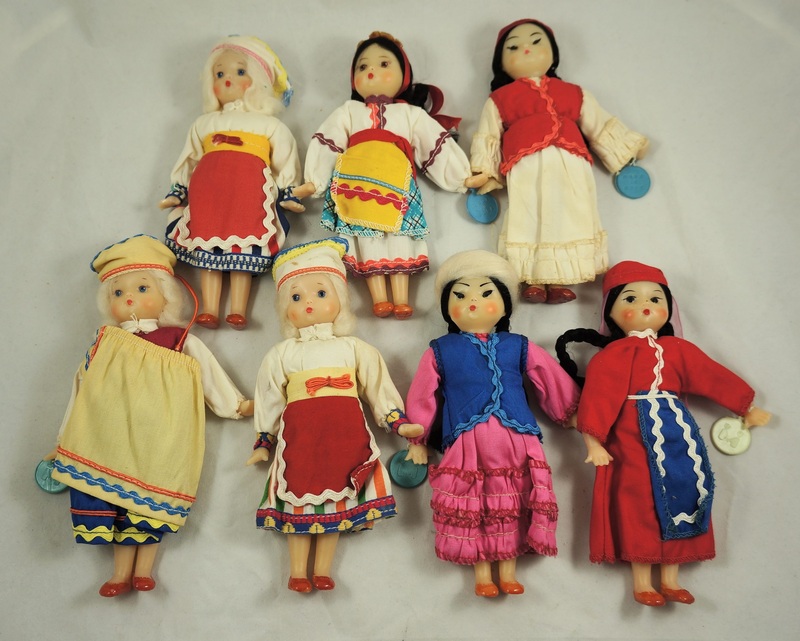 Two lots of Soviet dolls: 160$. I didn’t know if these would sell, but they were very clean so I figured I’d give them a shot. One buyer ended up buying both lots, and I made a decent profit. Found in Outremont. Original Francois Dallegret “Atomix” desktop toy: 300$. I found this at the Questionable Judgment spot back in 2017. 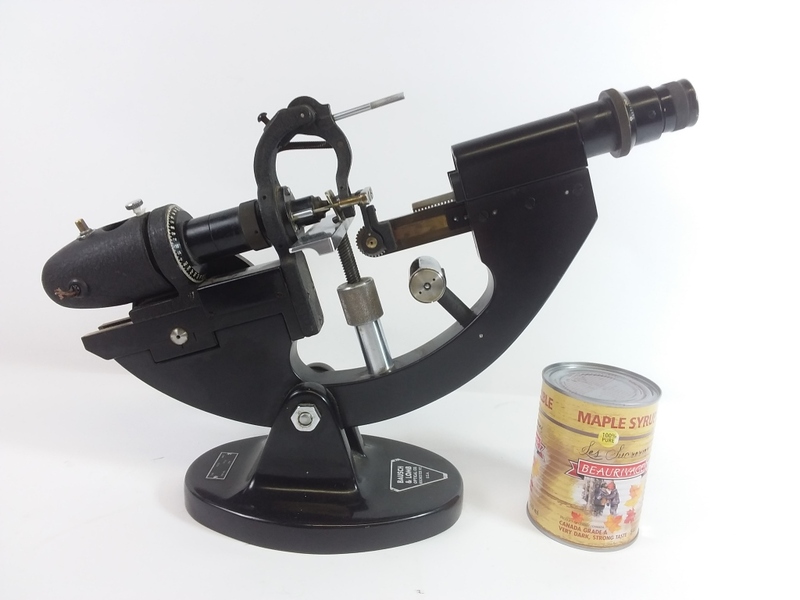 I took a while to list it, partly because it was impossible to find any comparable items online (especially for the original Canadian model, there was a limited re-release not too long ago but those were made in China). Eventually I decided to just make up a price, a high-ish one based partly on it being an uncommon concept art piece. Lo and behold, it sold the same night it was listed – someone must have had the relevant keywords on an alert list. Maybe I could have gotten more for it, I’m definitely happy with my profit here! 37 lots for 516$ (after fees). 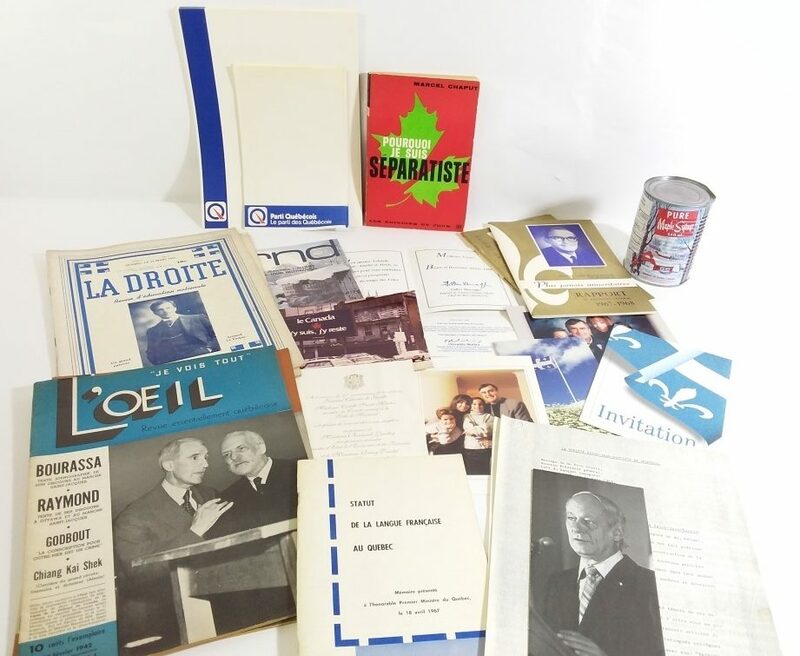 Lot of separatist literature & ephemera: 85$. Some of this stuff dated back to the 40s. Old B&L optometry doohickey: 44$. This thing weighed a ton! 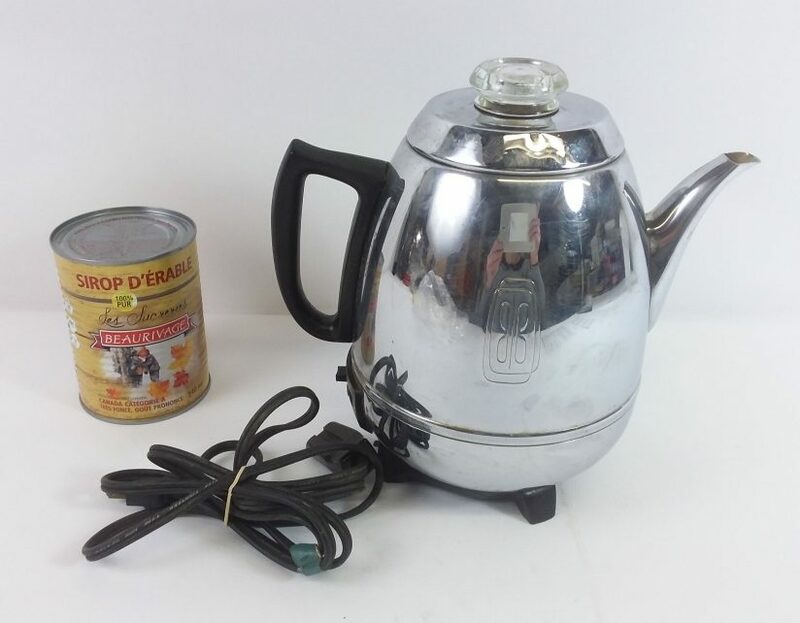 Vintage GE Percolator: 30$. This is one of those perfect auction house items. 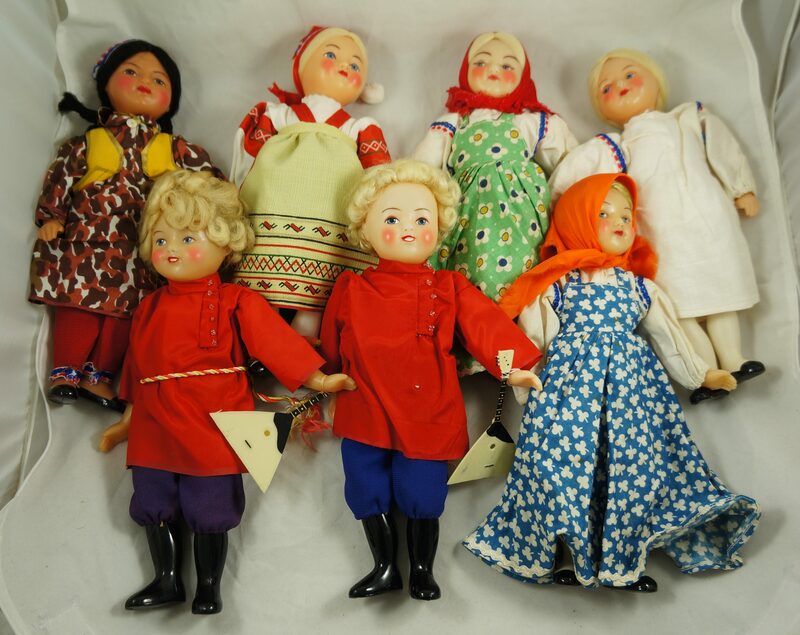 Shipping would be expensive (and thus cut significantly into my profits) if sold on eBay, and it’d be difficult to get a good price for it at a yard sale. Total: 2004.50$, 27131$ in 2018. It’s worth noting that I’m sure I lost track of a bit of income over the course of this busy year, including some gold / silver scrap money and probably a few yard sales. Overall, I’d guess that my income last year was actually pretty close to 30k, but not all the way there. As mentioned before, the way I do business has changed immensely since I was introduced to the concept of the local auction house. Thankfully this discovery took place in June, so I have an equal amount (six months) of data with which I can compare the different approaches. My earnings from January til the end of June represent the “before.” This pie chart looks similar in proportions to a theoretical chart I would have made in previous years, had I gotten around to doing so (adding up this info used to be a lot of work, but the recent changes I’ve made to the format of my sales posts has made accumulating this information a fair bit easier). eBay is clearly my dominant source of income during this period, while yard sales and scrap gold & silver provide a much smaller but still essential source of income. I consigned my first finds at the auction house in June, and you can see a little 2% sliver of auctions sales at the top of the pie. Here’s the after. 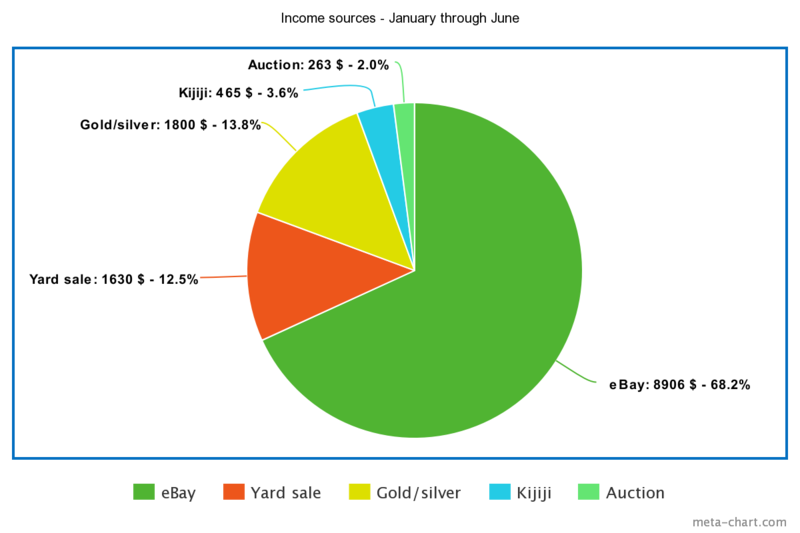 That tiny sliver of auction sales ballooned to take up over 40% of the pie. 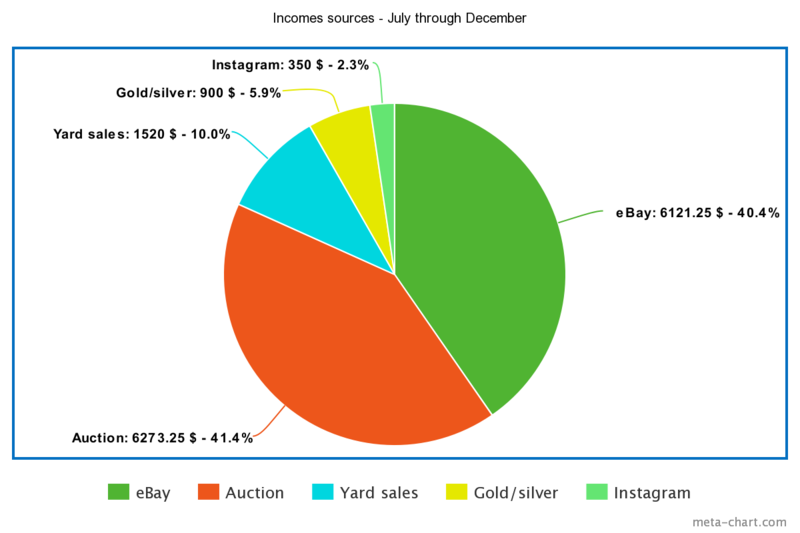 eBay sales declined in both total profit and pie percentage and are now essentially in a statistical tie with the auction house, though it’s worth mentioning that this is still a pretty small sample size. Meanwhile Kijiji falls totally off the charts, its previous role (mostly selling furniture and other difficult to ship items) having been overtaken by the auction house and Instagram. My total income for this period also increased, from 13064$ to 15168.50$. There are a few caveats in terms of using this information to project future income. For one, my auction sales were likely somewhat inflated by the fact that I used to have tonnes of quality junk just sitting around doing nothing, sometimes for years because I didn’t have time to deal with it all. Those things ended up going to the auction house and making me a fair bit of money, thereby creating profit from runs of yesteryear. Now that my storage areas are relatively empty my consigned items are all recent finds. That still constitutes a fair bit of stuff, but not quite as much as I brought there in those first months. I wouldn’t be surprised to see a drop-off in the auction house’s share of the pie if I do a similar chart in 2019, though I still expect it to be my second largest source of income after eBay. I should also note that, while I take the auction houses fees into account in the pie charts, I haven’t subtracted eBay’s fees from its total. That’s mostly because the auction house’s fees are larger and easier to calculate, but eBay’s fees (which combined with Paypal average about 10% overall) are still noteworthy – based on the numbers above I’d estimate that I paid them around 1500$ last year. Maybe I’ll see if there’s an easy way to calculate these fees on the go while doing sales reports in 2019. Regardless, 2018 was my most profitable year to date, and I’m thinking that I’ll finally crack 30k in 2019! It should also be a less stressful year, given that my garbage finds don’t pile up nearly as quickly as they used to. 2018 was an excellent year for garbage – I think this top ten list is my most valuable to date! The year also saw some changes to the way I do business. For one, I finally discovered the local auction house around the middle of June. It’s been a great way to unload things quickly and effortlessly while getting decent money for my finds. I can’t understate how much this has reduced the accumulation in my storage spaces, something that’s caused me a fair bit of stress over the years. It also reduces my reliance on eBay, though I’ll continue to use it for many items, especially smaller ones. I haven’t yet done the math, but I think my auction sales outpaced my eBay earnings in the second half of 2018. That’s due in part to the epic purge I undertook this summer, but I expect the auction house will be a prime source of income going forward. I also started leaving the house earlier when going on evening trash runs. For years I left at around 10:30pm, but one day (I’m not sure when) I realized that I could leave earlier and see the same amount of garbage. Now I start my runs around 8:30pm, which makes it easier to get to bed at a reasonable hour and perhaps go out in the morning as well. I’m not sure why it took me so long to figure this out, but I guess old habits die hard. Finally, much of the city used to have two garbage collection days per week. However, in recent years they’ve been slowly replacing (one borough at a time) one of those garbage days with a compost day. Now there are very few places that have two trash pickups a week. That doesn’t mean much for most people, but for me it’s great news because all of the garbage is now concentrated on a single trash day. It makes every run a little more productive, and I’m sure the new compost days contributed to this being my best year to date. Anyways, enough chatter. Here are my top ten finds of 2018! 10 – Tchotchke cabinet. 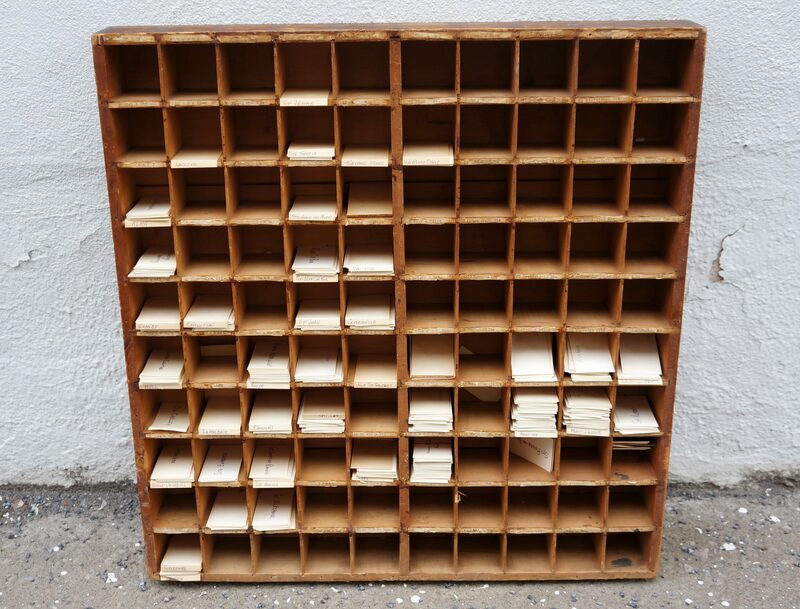 Most people seem to recognize this as a printers tray. Personally, I think it had a different purpose. Each hole was labelled with a place name (most of which were in Quebec), and inside were pieces of paper with even more place names written on them. It’s also a lot sturdier than most of the printers trays I’ve seen. Regardless, it’s a great piece that will likely be used to display miscellaneous junk going forward. It’s currently “on loan” with a friend, I might take it back when I have a vision for it. Also, I kept the pieces of paper – one day I might map out all the places in hopes of finding out what unifies them. 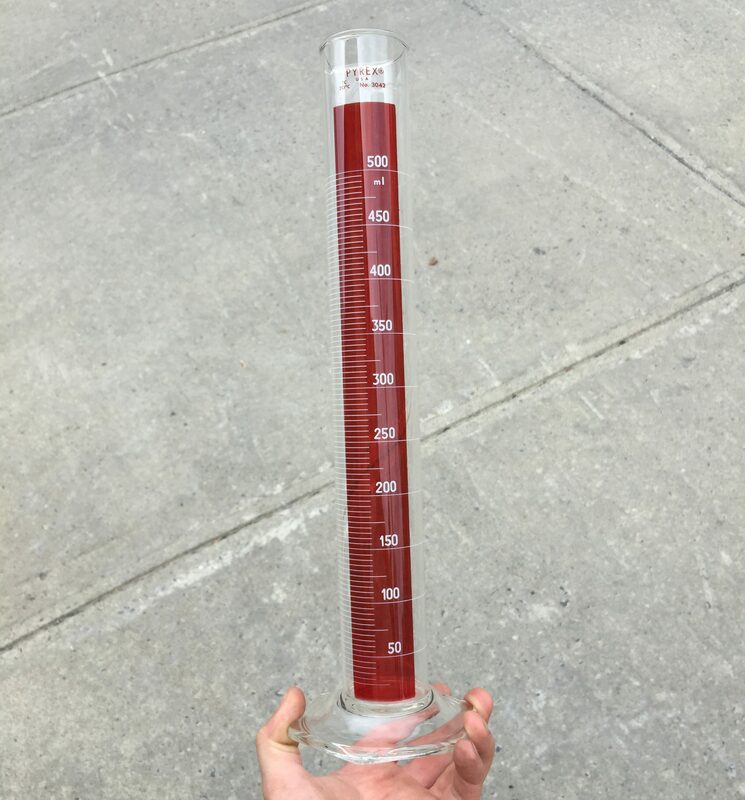 Found under a pile of junk in Rosemont. 9 – Collection of lab Pyrex. 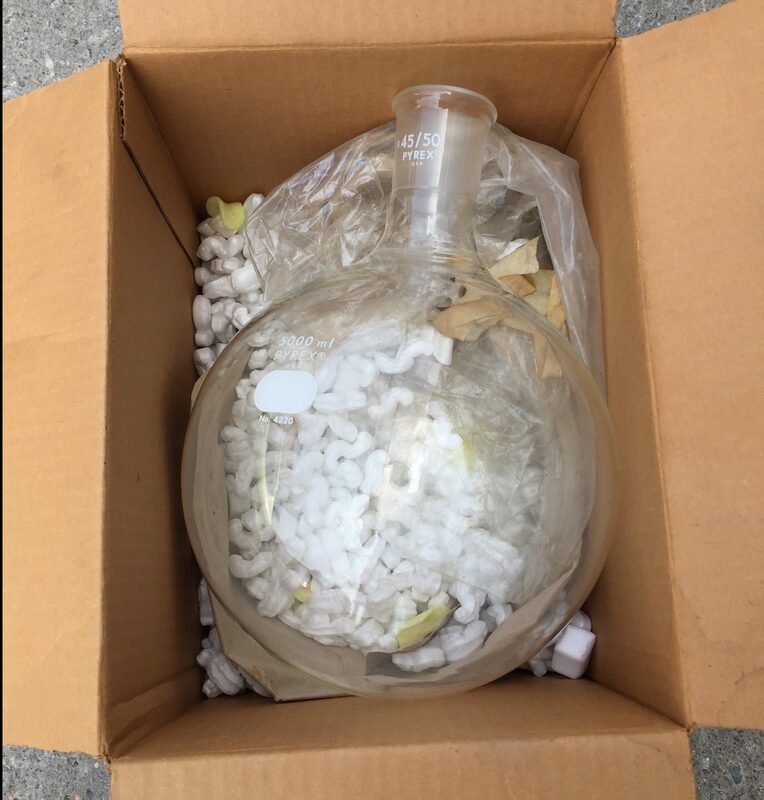 I was too busy to take many pictures, but over a few weeks I found hundreds of pieces (most of which were in their original boxes) ranging from the humble beaker and Erlenmeyer flask to the more exceptional models you see here. Thank goodness I had discovered the auction house by then as I’m not sure what I would have done with it all otherwise. Without looking at the numbers I’d guess that the collection netted me somewhere around 500$. Found in the Mile End. 8 – Old platters. As mentioned in my last post. These could move up in the rankings depending on their value, but I have more research to do before I can say anything with confidence. Regardless, they’re very beautiful and I expect that they’re eBay-worthy. Found in the Golden Square Mile. 7 – Expensive perfume collection. Most of the nice perfumes I find are vintage. This collection, however, was relatively fresh and fairly expensive. The Kilian “Smoke for the Soul” sold for 115$, the “Tuscan Scent” by Salvatore Ferragamo sold for 120$, and the Byredo “Super Cedar” went for 50$. Those were all friendly rates as well – they would have gone for a bit more than that on eBay. Found in Westmount. 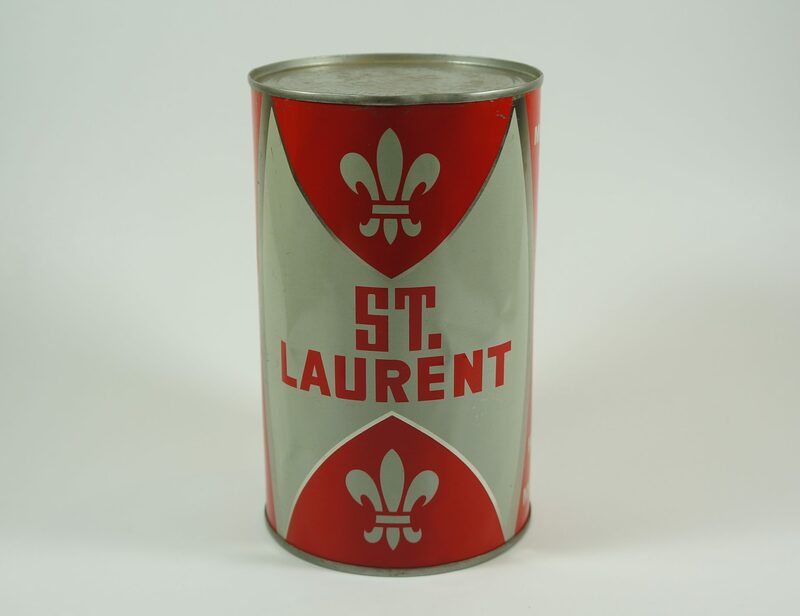 6 – 1950s St Laurent oil quart. Petroliana is very popular these days, and the oil tin has become a desirable collectors item. This one was pretty rare – I couldn’t find another like it online. So, I wasn’t totally surprised when it sold for 355$ via eBay auction. That still seems like a lot of money to pay for a tin, but I’m not complaining. Found in Nouveau-Bordeaux. 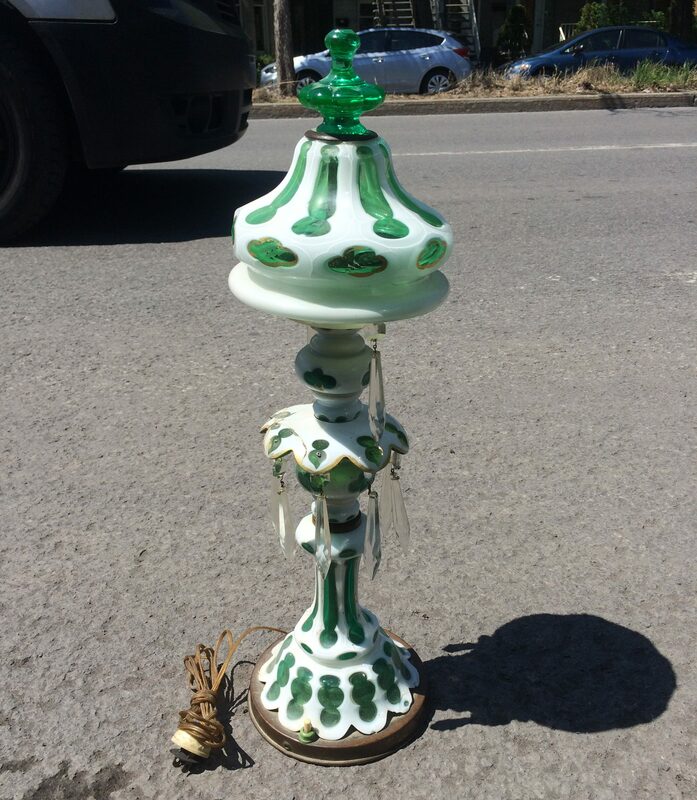 5 – Uranium glass lamp. 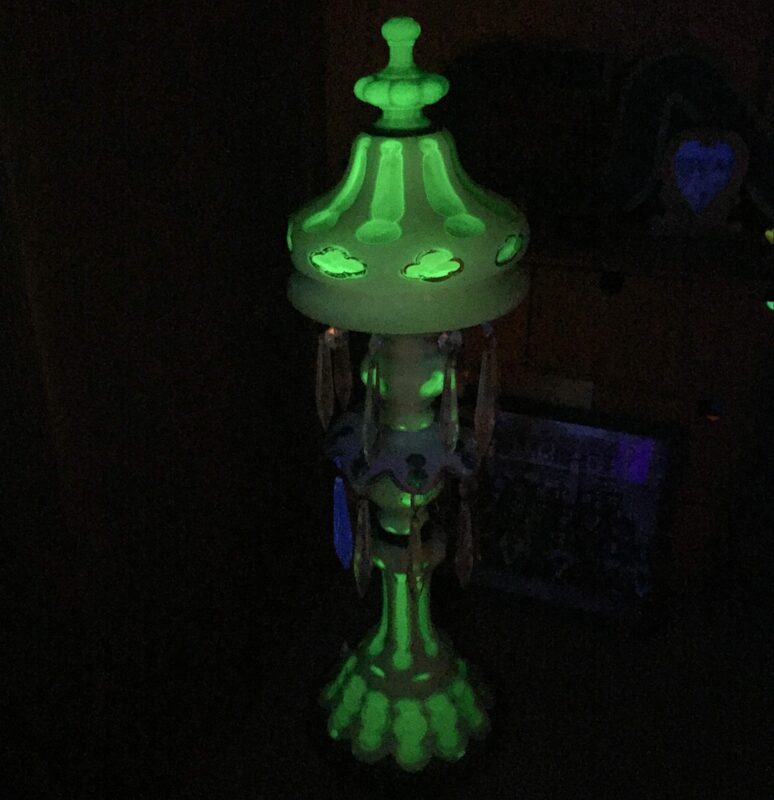 This thing sat in my basement for months before I thought to check and see if that green hue was a result of uranium. Sure enough, it glowed very nicely under UV light (as you can see below). 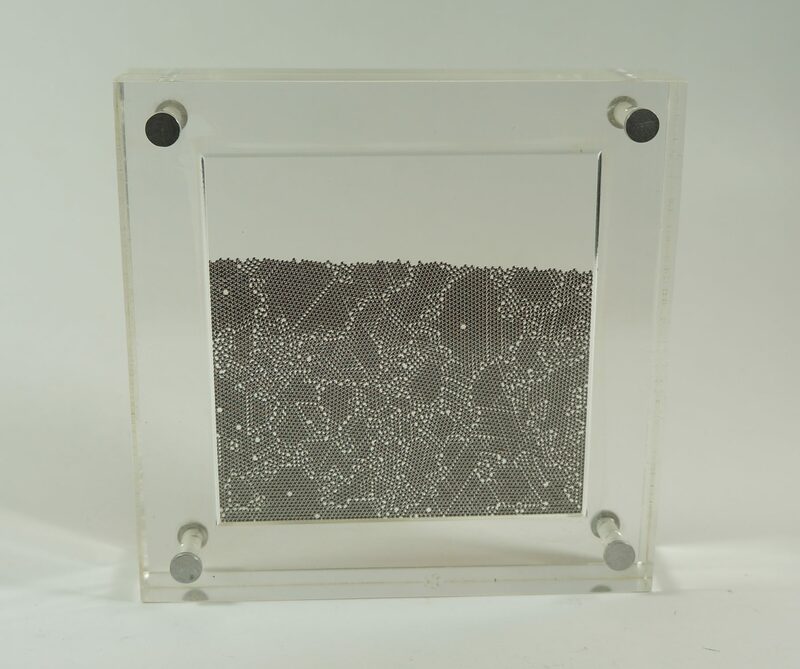 The glass was broken in a couple of places, but thankfully I found the pieces and was able to repair it so that the flaws weren’t too noticeable. It’s a great piece, and it definitely gains some value being uranium glass. Found in TMR. 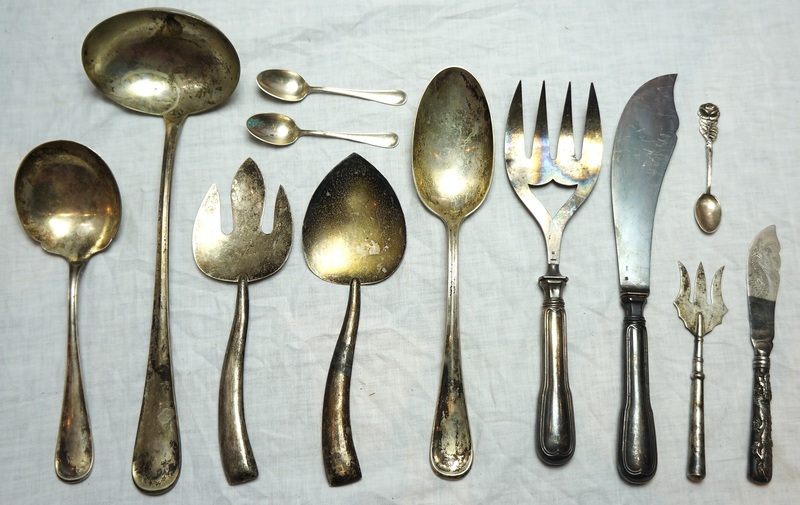 4 – Silverware collection. 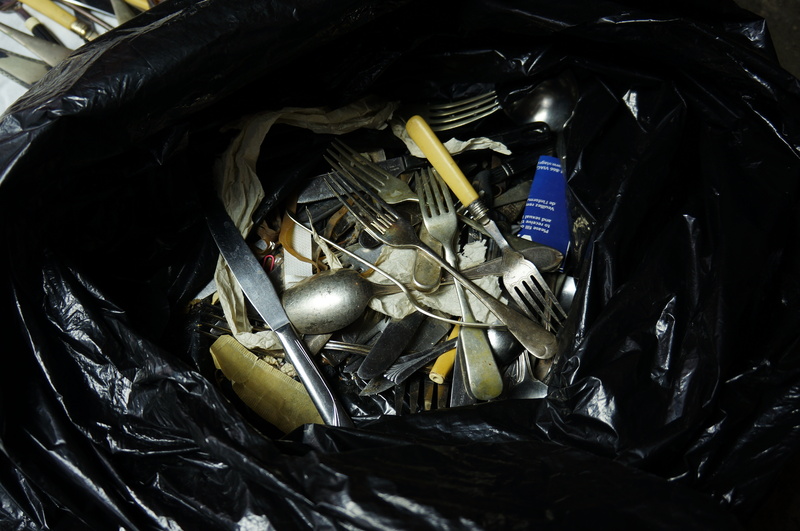 This bag contained a collection of old cutlery, some of which was 80% and 92.5% (sterling) silver. Overall I saved over a kilogram of solid silver. I melted the damaged pieces and listed the nicer ones on eBay, many of which you can see below. 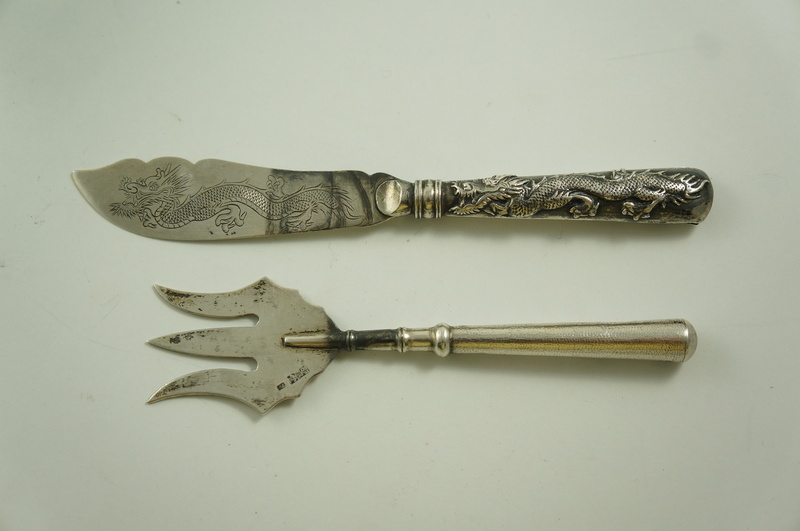 I still have yet to figure out the origins of two pieces, including a knife with a dragon motif. If you know anything about them please let me know! Found near Vendome metro. 3 – Cold hard cash. 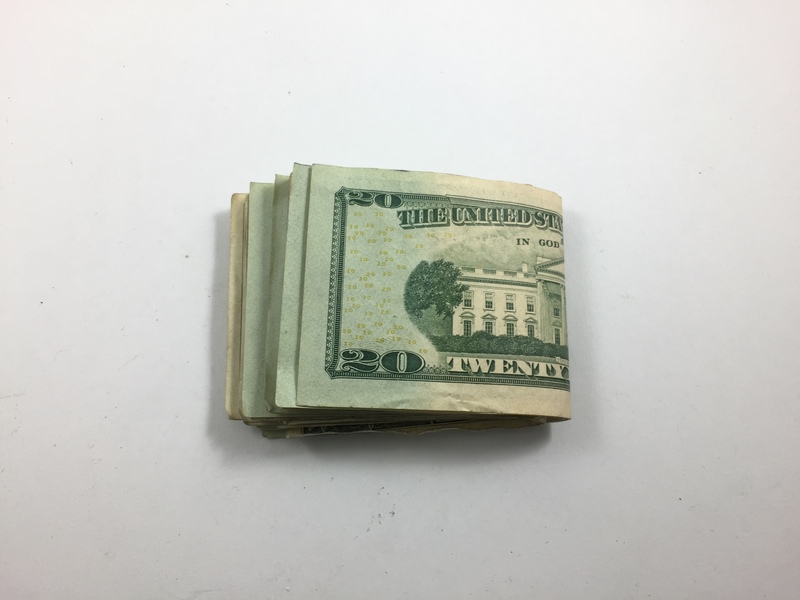 2018 was my easily my best year ever in terms of finding cash. I saved 307 USD (nearly 400 CAD) in Nouveau-Bordeaux, 262$ in a fake fireplace in the Mile End, 140$ in some shirt pockets in the Plateau, and a coin collection featuring old bills and several silver coins. On a related note, I also found 225$ in unused gift cards, besting my previous best of 68$. I doubt I’ll get nearly as lucky in 2019, but you can never know for sure. 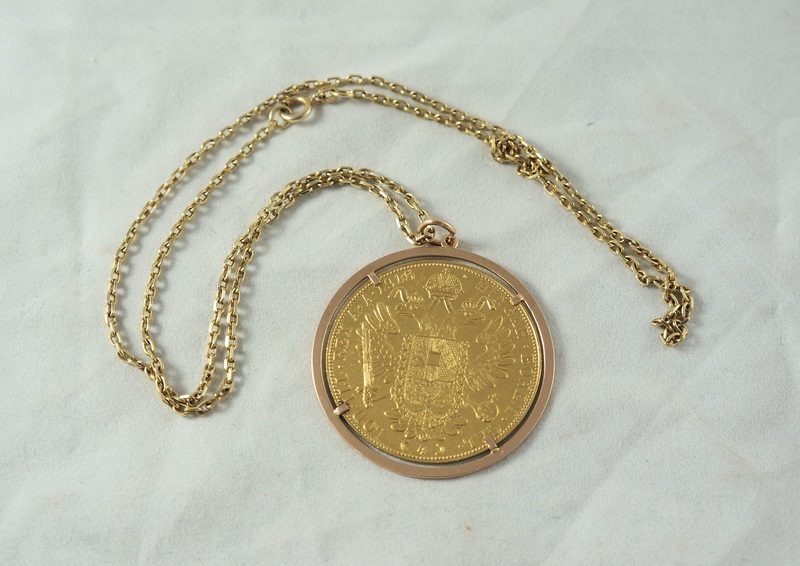 2 – Austrian 4 ducat gold coin in a 18k gold frame on an 18k gold chain. God only knows why someone threw this out – my guess is that it was a gift to a privileged kid who didn’t know any better. Either way, it ended up being a nice little windfall for me. This ducat coin is pretty common, so I wasn’t going to get much above scrap weight for it. Still, I was able to sell it to my jeweler for around 1000$. This is the best find that I don’t remember finding – sometimes, especially when it’s cold I’ll throw things in the car and figure it out later. The one thing I know for sure is that it came from a certain rich neighbourhood. 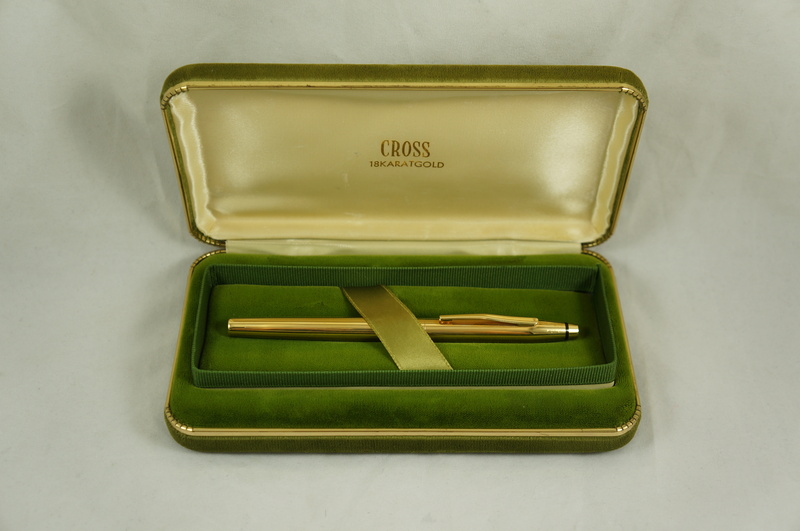 1 – Solid 18k gold Cross fountain pen. My best find of the year was one that didn’t made the blog. It came to me in the summer, right when I was super busy switching garages and trying to get on top of my overwhelming collection of junk. I usually like to take my time posting my more awesome finds anyways, but before I knew it months had passed and I figured I might as well save it for the top 10. 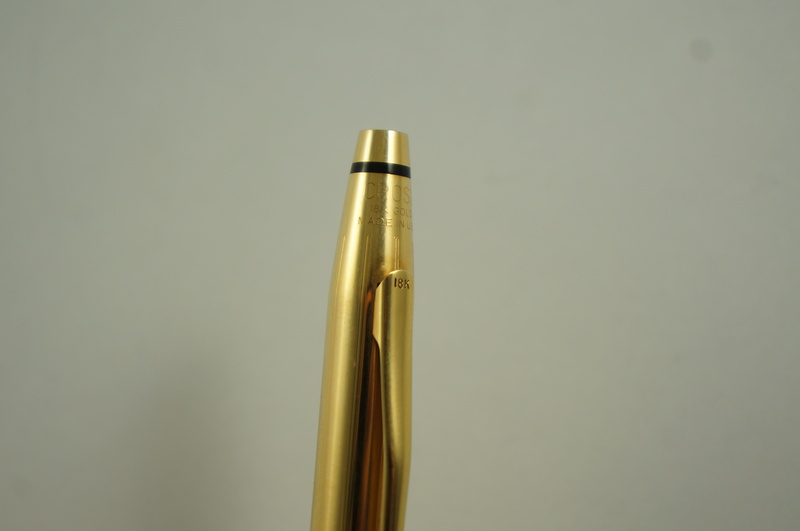 This Cross pen looks like most other Cross pens, the main difference being that instead of being gold-filled (as many are) it’s made from solid 18k gold. This is an upper class pen, one that only CEOs and others in the 1% could ever hope to afford. I have it listed on eBay for 1500$, which I think is a reasonable price. I expect it will take a while to sell, however, as the market for fountain pens costing over 1000$ is fairly small. Found in Outremont. 2019 is off to a bit of a slow start. I’ve made some good finds, but nothing that seems worthy of next year’s top-ten. However, I’m sure the awesome garbage will come eventually, especially after the weather improves! Recently I’ve been covering downtown, in particular the Golden Square Mile a little more often. I think I’ve been underestimating the potential of apartment buildings, especially those housing a wealthier demographic. Sure, most apartment trash goes down a chute and mixes together at the bottom, creating an extremely smelly and generally undesirable concoction that I’d prefer to avoid at all costs. 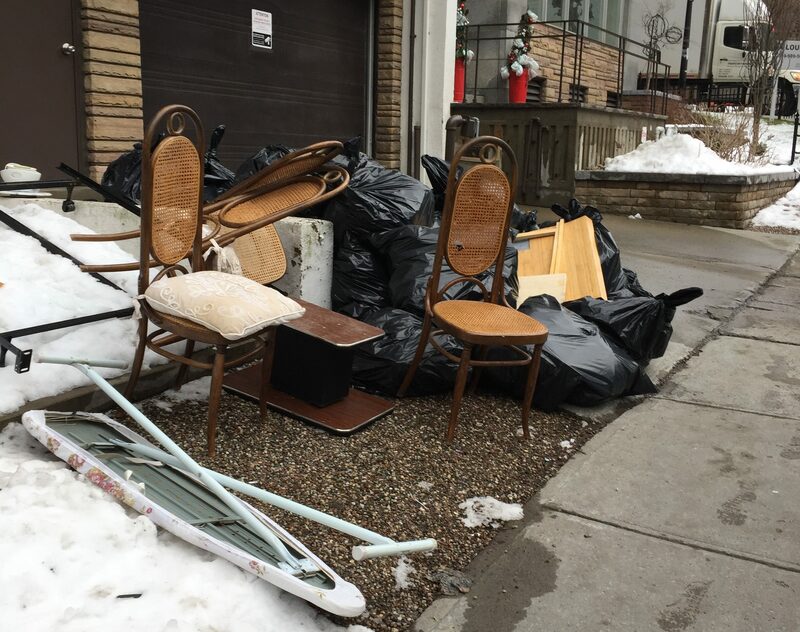 However, I’m sure a lot of people, when moving or clearing out an apartment, figure that it’s easier to bring their bags of goodies to the curb rather than cram all their junk down a small hole. Or, so I can hope. Regardless, I found these coins just off Doctor Penfield while out on a casual run with my mom. There’s more than 10 Euros there, as well as 6+ British pounds, which adds up to around 25 Canadian dollars. People throw out their foreign coins on a pretty regular basis. 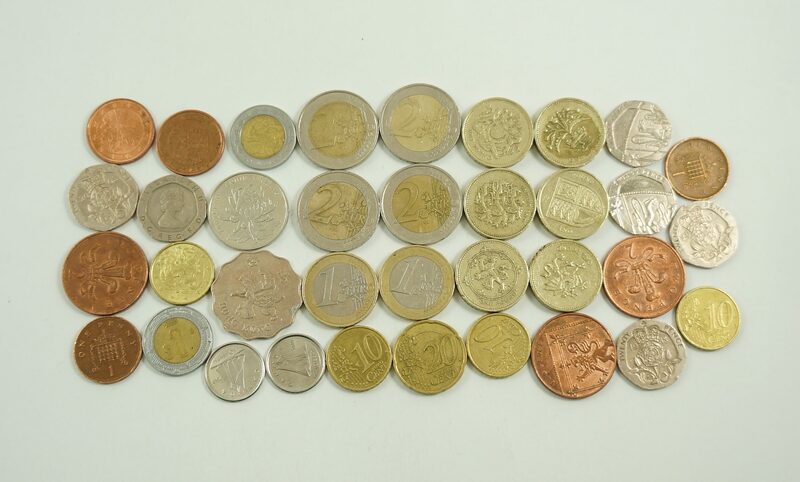 This is my current stash of Euros and British Pounds, the currencies most worth holding onto (I also keep Australian & New Zealand dollars but those don’t turn up quite as often). I forget what this all adds up to now, but it definitely translates to somewhere around 100 Canadian dollars. 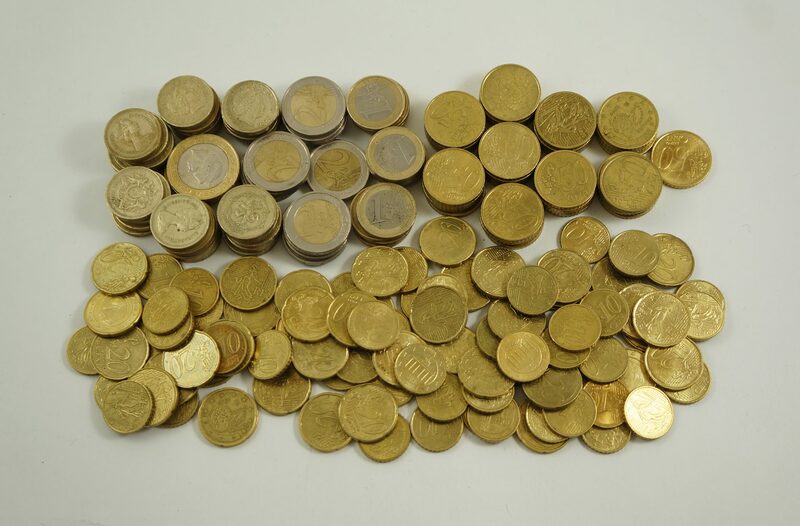 Most foreign exchange places have no interest in coins but I was able to sell my last collection to a couple of blog readers for somewhere between 1:1 and the actual exchange rate. If anyone else is traveling to Europe soon and doesn’t mind bringing a couple pounds of coins with them let me know! This pile provided my best downtown apartment finds in recent memory. 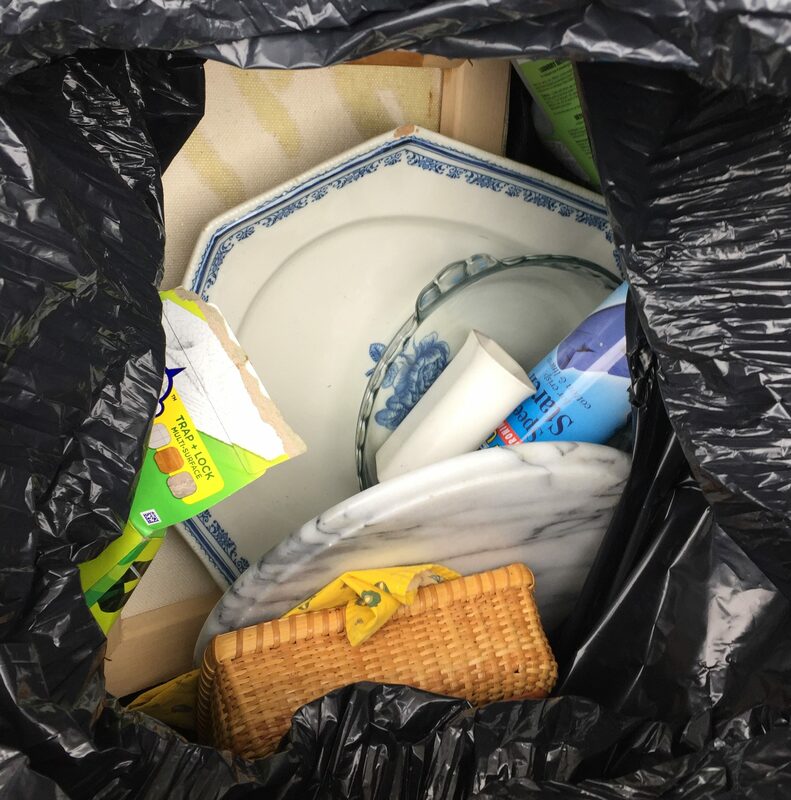 Many of the bags held gross chute trash but others contained old china and other kitchenware. You’d think that this kind of stuff would break on its way to the curb but more often than not it survives the trip. 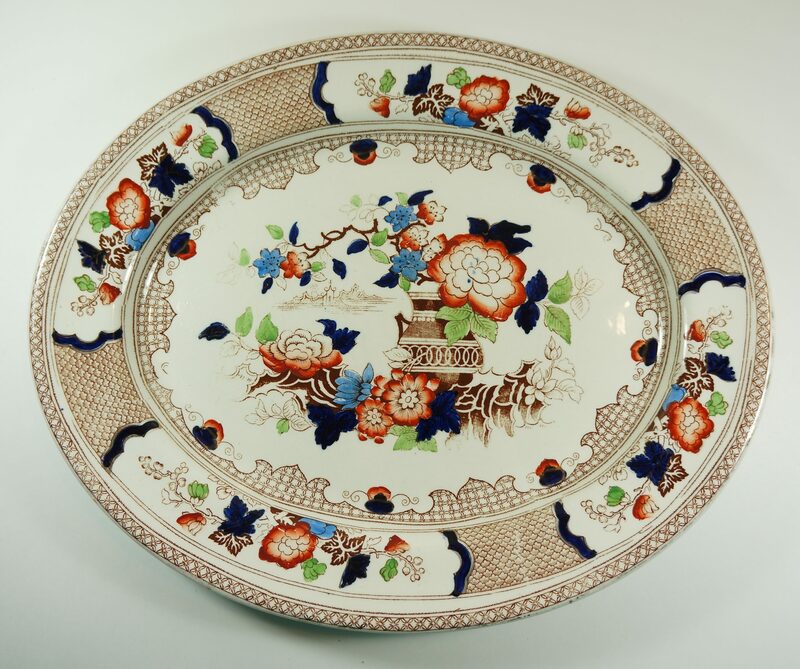 This place was perhaps most notable for its platters, a couple of which look to be quite old. The one at top left is a Paloma Picasso piece so that’s not quite vintage, but the ones below it are definitely dated. 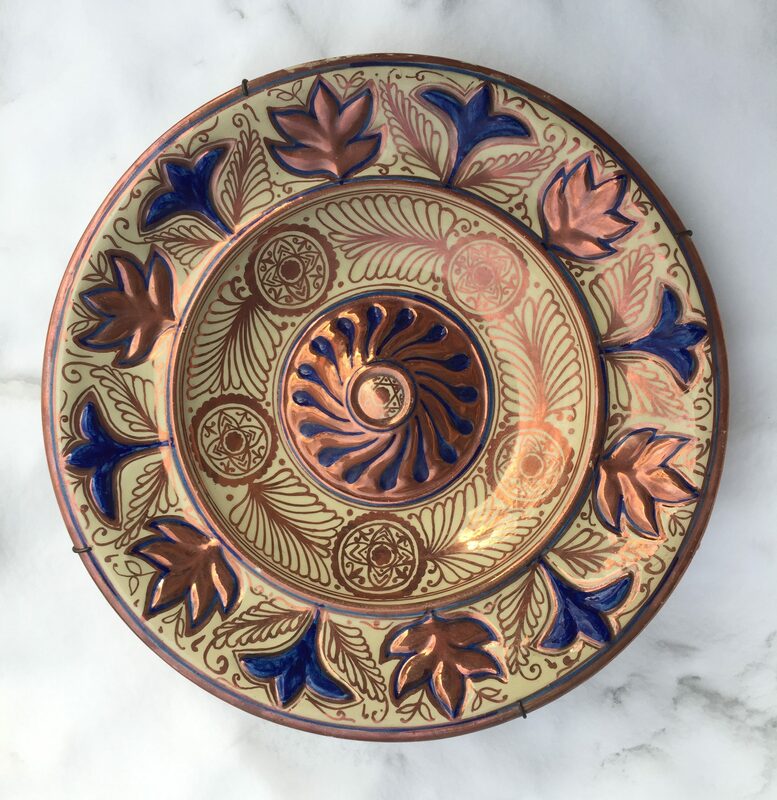 I’d guess that this one is the oldest of the bunch – it has a sort of uneven glaze, especially on the bottom, and bears no signature. 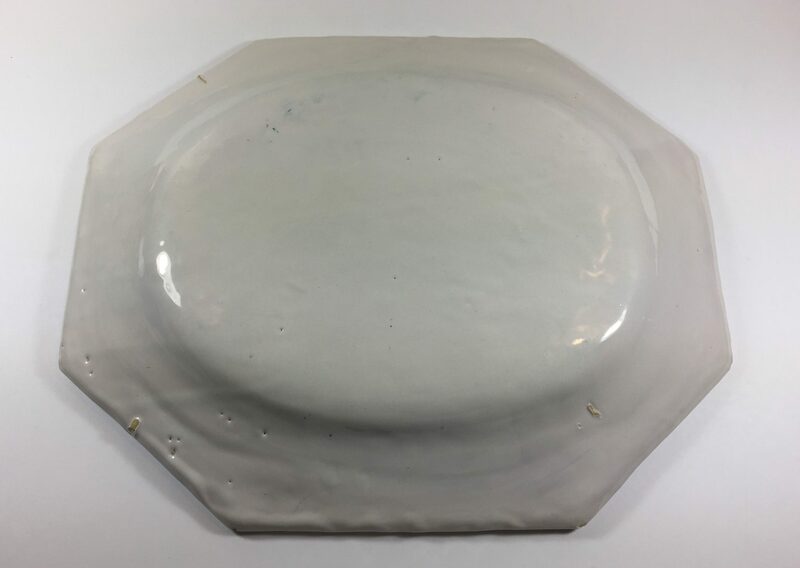 After a bit of google searching I found a platter that has a similar design, at least in terms of the octagonal shape and the way it was glazed. That one was made in the 1700s, and shows wear on the underside that you’d expect from a piece that age. Mine doesn’t show much sign of wear, save for a few chips around the edges, meaning that it’s either been extremely well preserved (aside from it’s trip to the curb) or is a relatively recent reproduction. 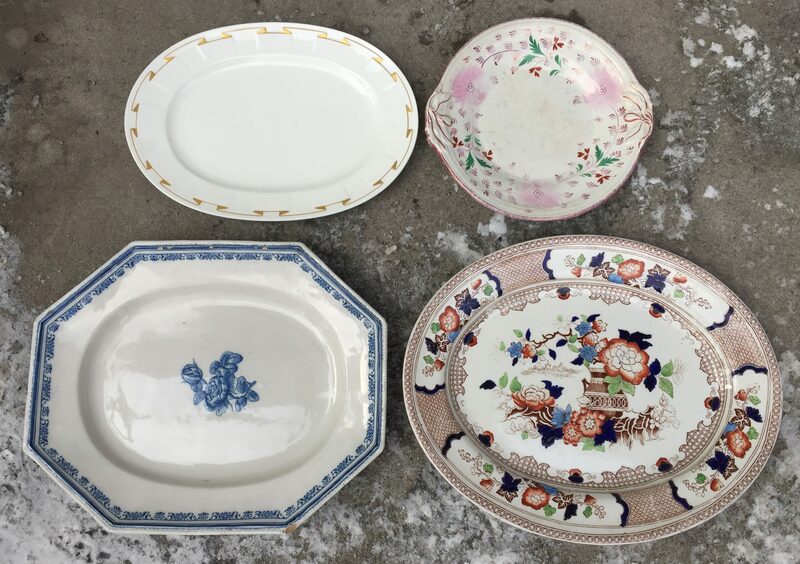 I don’t know much about old dishes, so please let us know if you do! This one looks quite old as well. The pattern slows slight inconsistencies, making me think it was painted by hand. 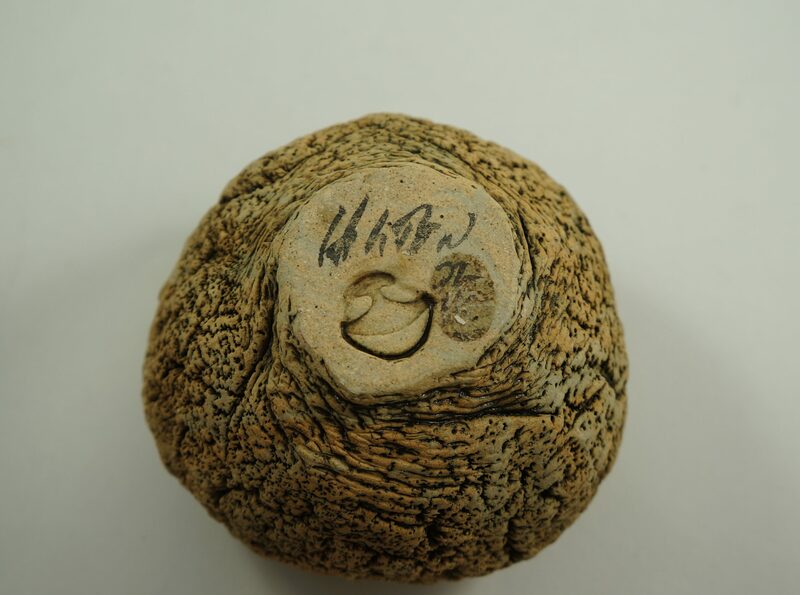 It does have a mark of some kind on the underside, though I have no idea what it says. It’s possible that they’re letters or numbers in a language other than English – the first two symbols look a lot like Arabic. I also found this little guy. 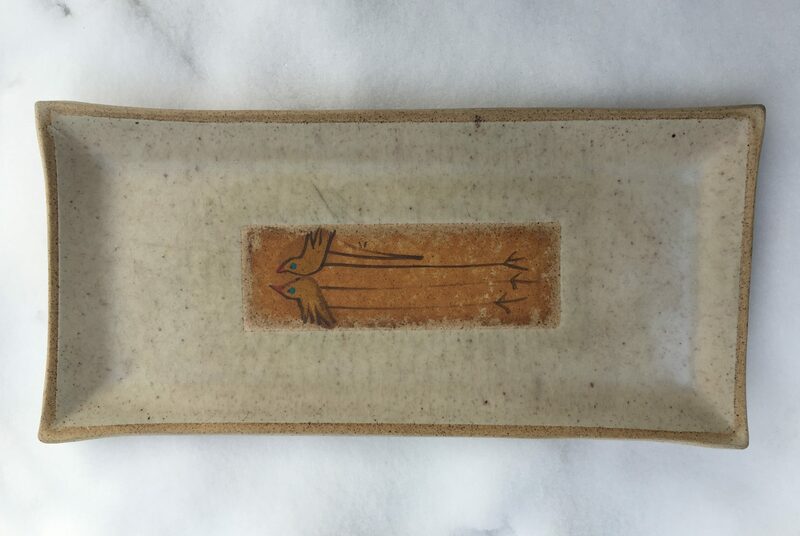 It measures about 15×6″ and looks pretty “mid-century.” Unfortunately it doesn’t seem to be signed, but let me know if you’ve seen something similar. 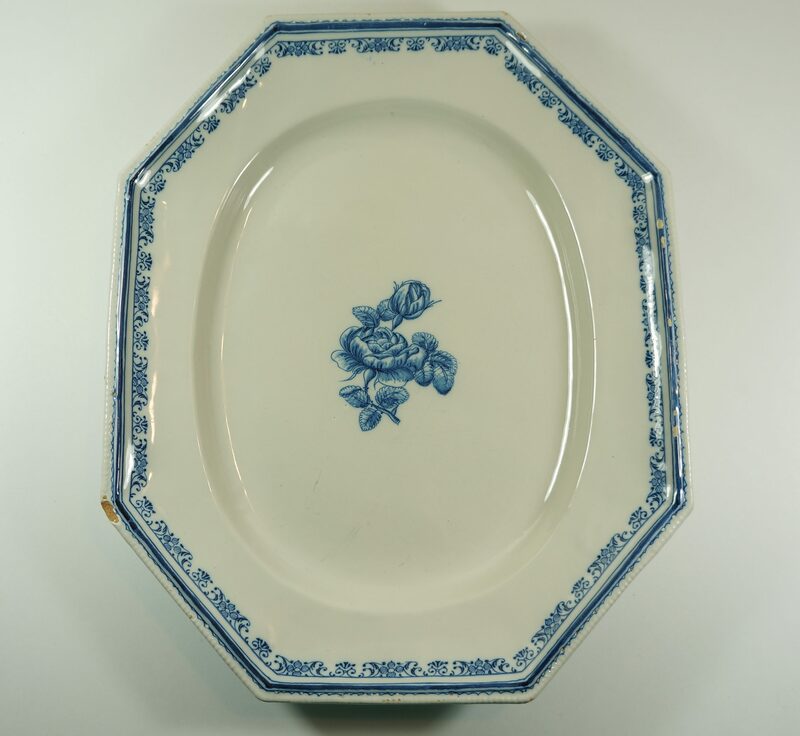 This large 17″ decorative dish was also an interesting find. There’s a Star of David in the middle so I’d assume it’s of Jewish origin but I know nothing of the design otherwise. There are wires on the back for wall hanging, but I suppose those could have been put on after the fact. I’ve never seen anything quite like it, so let me know if you have! Regardless, I feel lucky to have found it in such good condition. I found a bunch of intriguing stuff at a spot in TMR this summer, but unfortunately I wasn’t able to catalogue most of it. 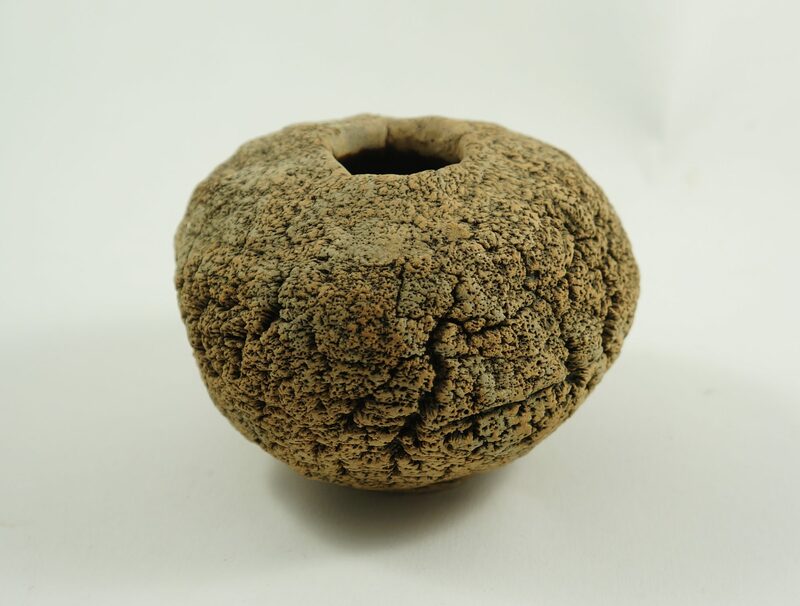 I still have one unusual object I found there, that being this ceramic vase (about 5″ in diameter) that looks like stone or petrified wood. It’s signed on the bottom but I can’t make out what it says. If you know anything about it please let us know in the comments! 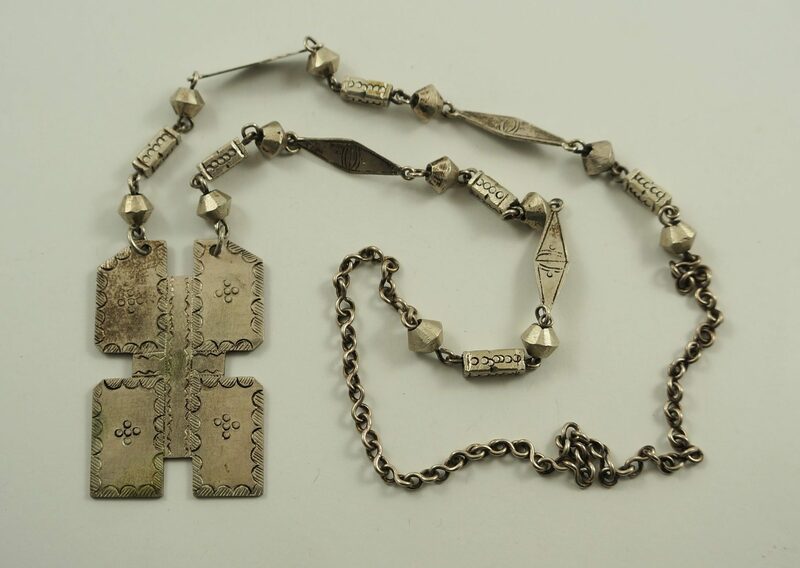 I found this necklace in with some other less notable pieces. There aren’t any hallmarks but I’m guessing it’s made from a low grade silver (like 80%). I should test it. Anyways, it’s a neat design and I’m hoping someone here will recognize it. It looks a bit “tribal” to me. 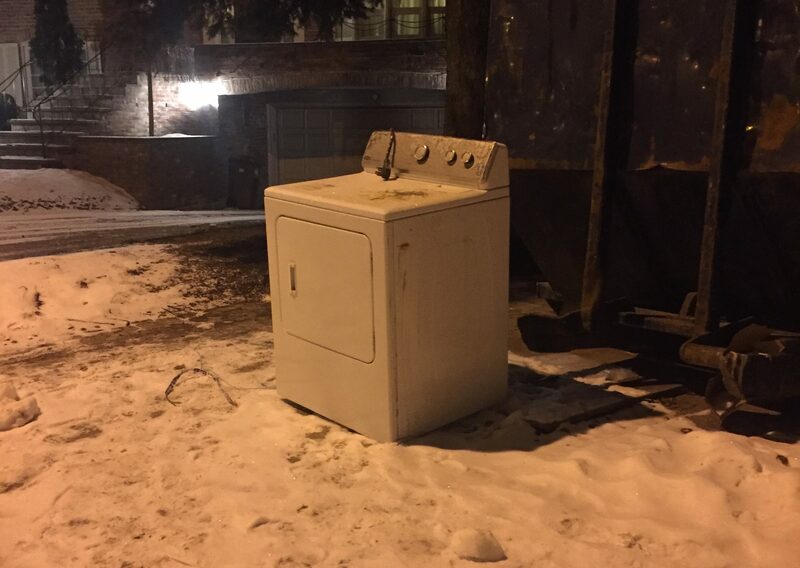 The dryer at my house broke, so when I happened upon this one on the curb in a rich part of town I decided to give it a shot. I didn’t know if it would fit in the car, but it slipped into my hatchback with an inch or two to spare. I wish I had a video of me wrestling this into the car by myself – it was quite the feat! It did end up working, so I’m glad I made the effort. 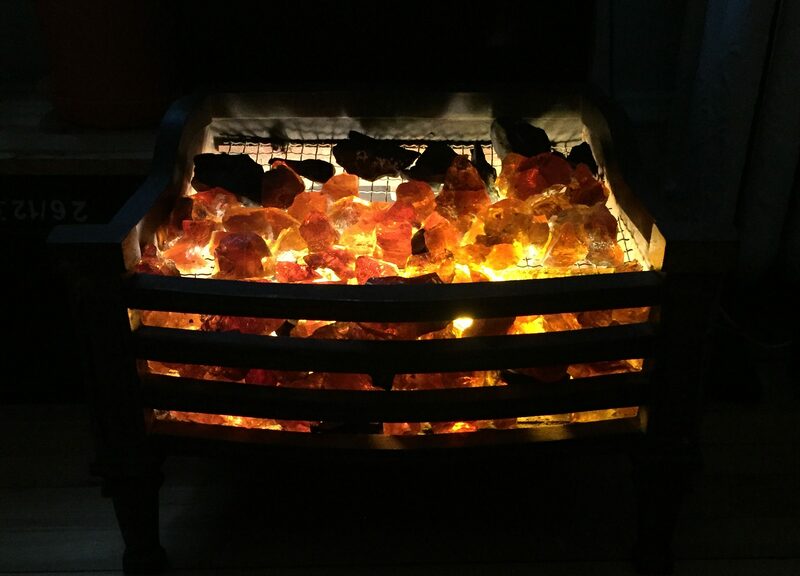 Let’s finish with this old c. 1930s “Magicoal” faux fireplace that I spotted one night on my way back from the grocery store. I met the guy who brought it to the curb, he was clearing out his apartment because the triplex he was living in had recently sold. He encouraged me to take it, and mentioned that it had been in the house since he moved in – and presumably for a long time before that. I was going to take it either way. These things make fun mood lights (as seen above), and if I decided not to keep it I knew it’d sell for a bit of money at the auction house. As I went to pick it up I also thought about how it’d be a great place to stash something. Indeed, I looked in the back and spotted a dusty bank envelope. I excitedly carried the beast (the thing is cast iron and must weigh about 50 pounds) back to the car for further inspection. 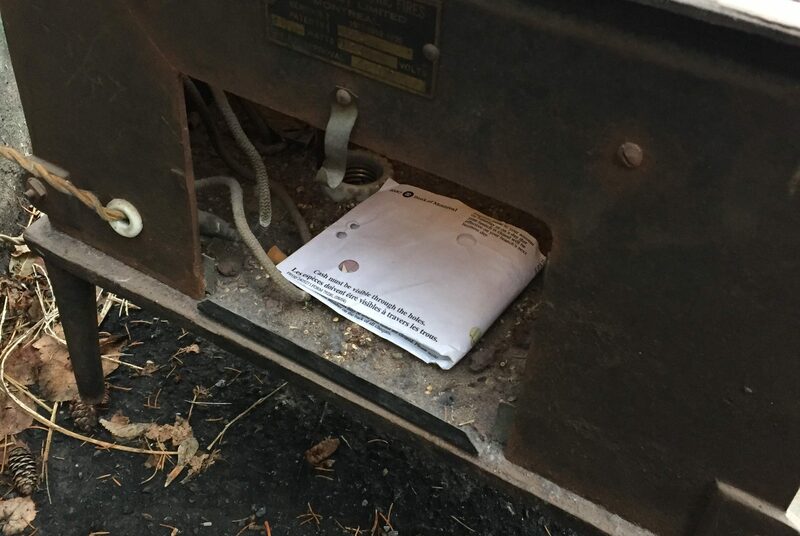 Inside the envelope was 262$! I doubt it belonged to the guy who tossed it, as he was younger and didn’t seem like the type to forget their stash (especially after going out of his way to bring this thing to the curb). 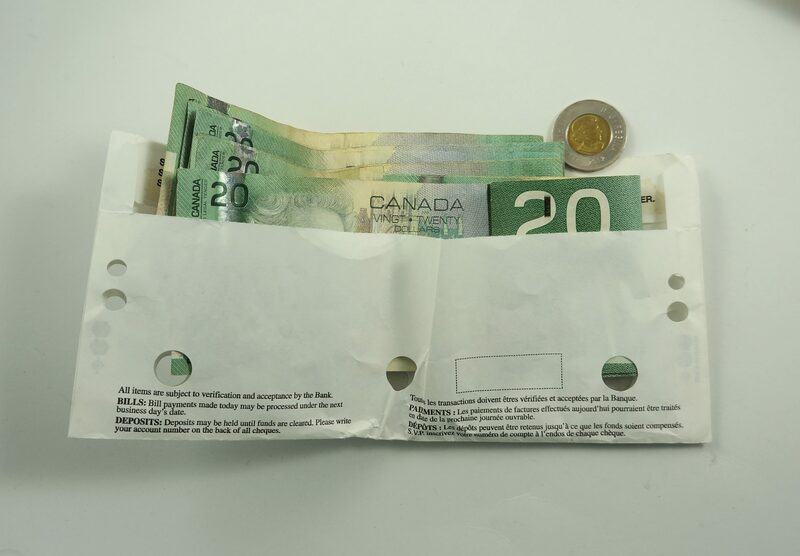 I’m guessing it was left by a previous tenant – the bills were all from 2004 and the toonie, which looked lightly circulated was made in 2012. I never had much luck finding actual cash in the trash before 2018, but then I found three figure stashes on three separate occasions. I’d be happy if this trend continues in 2019, but it’s more likely that the garbage gods will choose to reward me in some other totally unpredictable way.